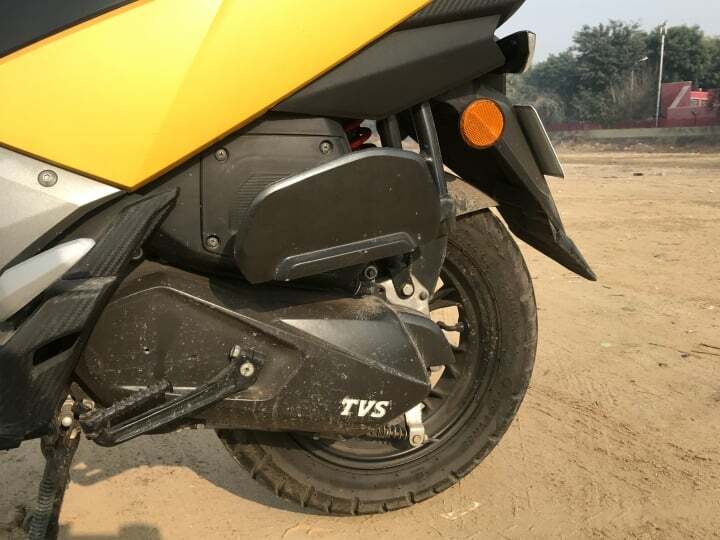 TVS Ntorq 125 was launched back in 2018 and went on to be an instant hit. 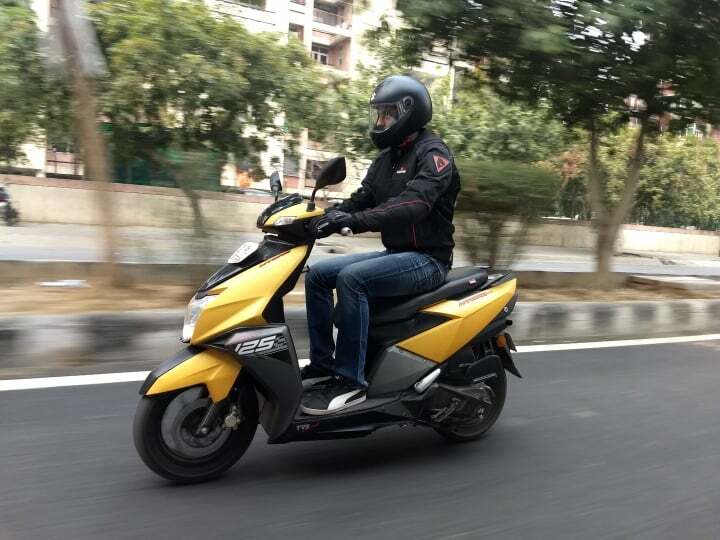 It falls in the premium 125cc scooter segment, which is what a lot of buyers are going into. Almost every month, it has managed to sell more than 15000 units, the highest in its segment. 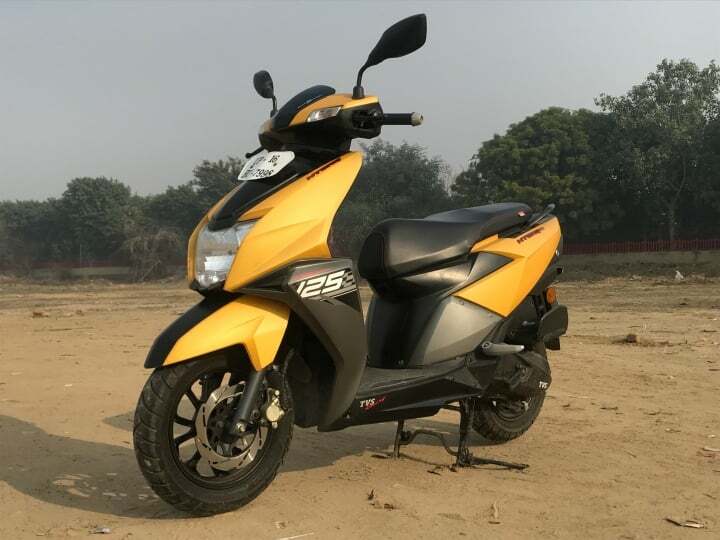 It competes with Suzuki Burgman Street, Aprilia SR125 and Honda Grazia. 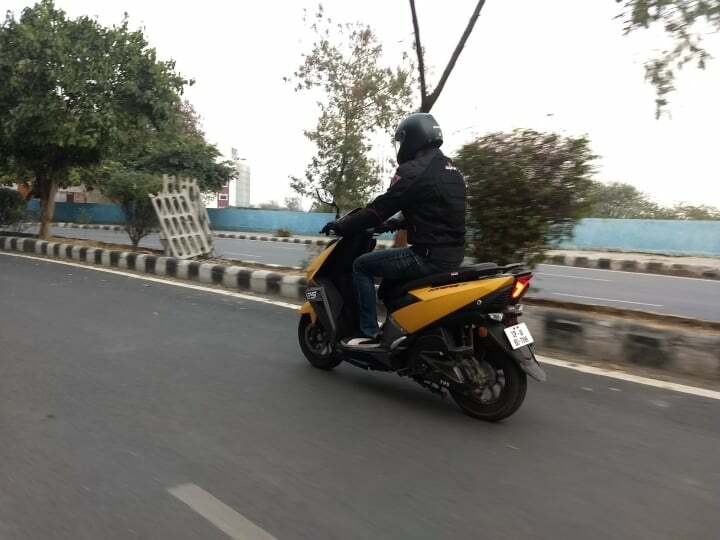 So, here we have the Ntorq 125 for a detailed road test review to check if it fits as a racing scooter or just a fancy/sporty looking scooter. We have reviewed its styling, acceleration, features and handling over a brief period of time. Check it out ahead! TVS Ntorq 125 seriously looks like a healthy athletic guy. Its sporty appeal is to watch out for as it is liked by people of all age. We had the Yellow-Black paint job, which instantly reminded me of Bumblebee. The front portion of the scooter gets sharp creases paired with light muscular body. The turn indicators on the handlebar seem kind of refreshed and out of the box. On the sides, it gets a matte grey paint with ‘125’ decal over it. The ‘TVS racing’ decal below the footboard is an added indication of the sporty behaviour of the scooter. Towards the rear portion of the scooter, the creases start tapering, resulting in an overall sharp appeal. 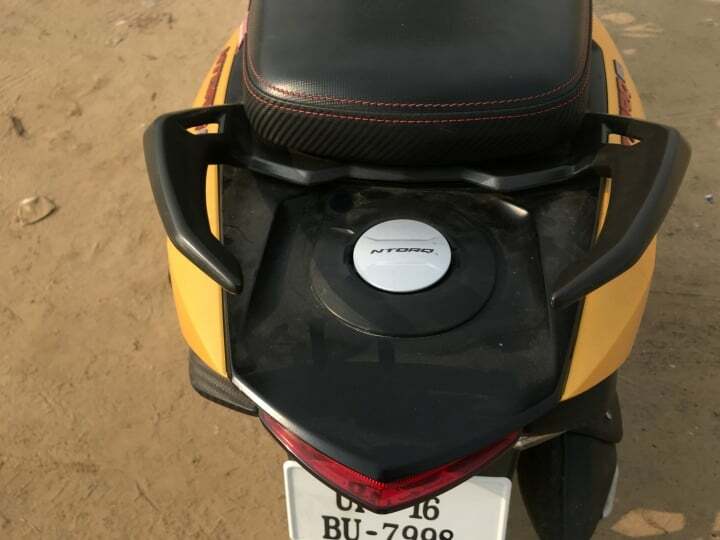 The stylish smoked tail lamps look refreshed while comparing it with other scooters and also a bit premium. 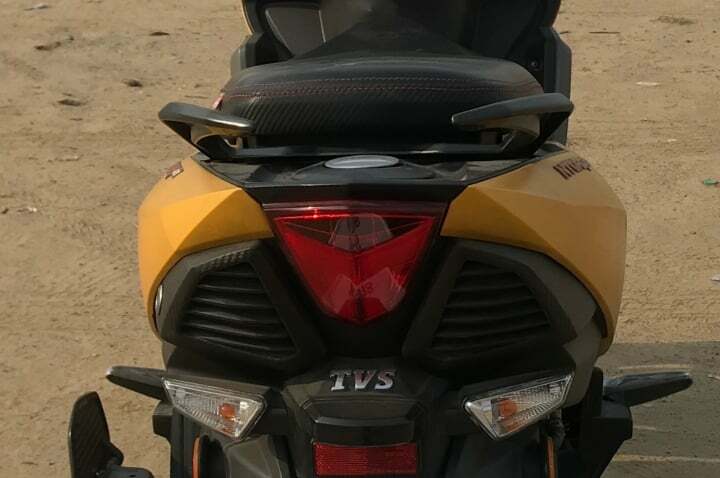 Let me tell you, TVS has put its trademark Racing DNA, taken from the Apache series, in the Ntorq. It would not be a racing scooter exactly, but definitely is sportier than many of them. Ntorq delivers 9.4 Horses, which is higher than many scooters in its segment. As soon as you start the engine, it takes no time in readying up. The engine does not give any lag, no signs of less enthusiasm. It is not peppy as compared to Burgman Street, but offers more than enough punch. Yes, the engine produces some vibrations after crossing 70-80 km/hr, but these vibrations are the ones that make your adrenaline pumping. Racey Vibrations! But the engine is quite refined and no vibrations up to 80 km/hr in a 125cc scooter is the done deal. 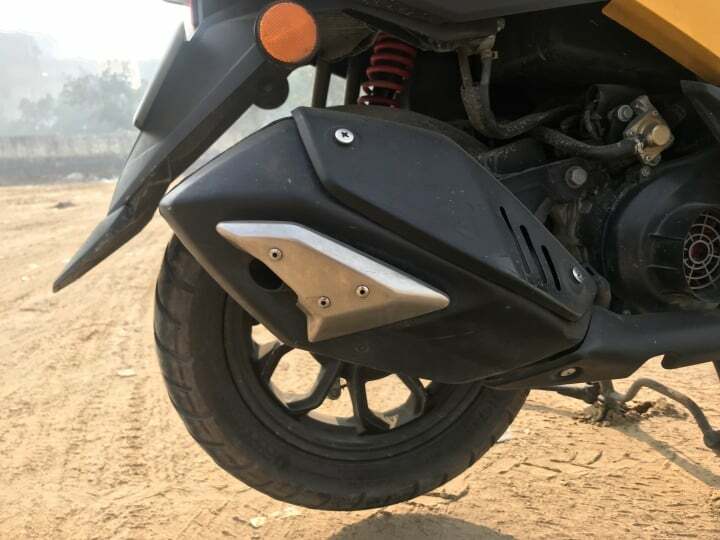 TVS Ntorq 125 gets a racy exhaust note, which makes you want to rev up more. That combined with the punchy engine is what will excite the millennial. Here, I was able to acheive a top speed of 99 km/hr, which could have gone up by 1-2 km/hr. Usually, the scooter makes a loud note if you cross its relaxed cruising limit, but here, the higher you go, the better it sounds. TVS Ntorq 125 is one of the heaviest in its class, tipping the weighing machine at 118 kgs. Actually, you would not feel the weight of a two-wheeler while riding, its while moving out of your parking spot or dragging it around. The handling was nimble, did not give much trouble in zip-zapping through the traffic. Probably, all thanks to its exhaust note and sporty engine, you would often take it through the hard corners. Need not to worry about that. The chunky 12-inch tires were sticky enough and thanks to the heavy rain spell in the NCR, I got to test it on wet roads too. It did not lose its grip even in the hardest of cornering (Not the bike type cornering) or during sudden braking. Lastly, because of its heavy weight, it does not wobble a bit. 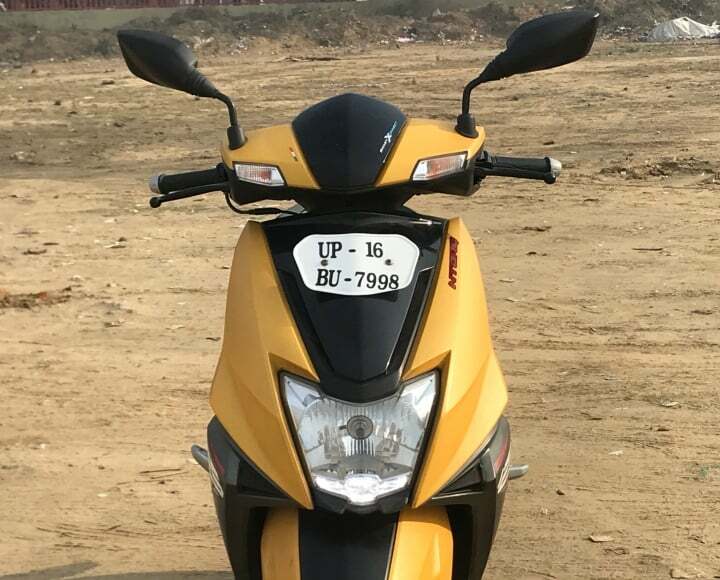 The ride feels balanced and well satisfied even whilst riding in the city or on the highway. 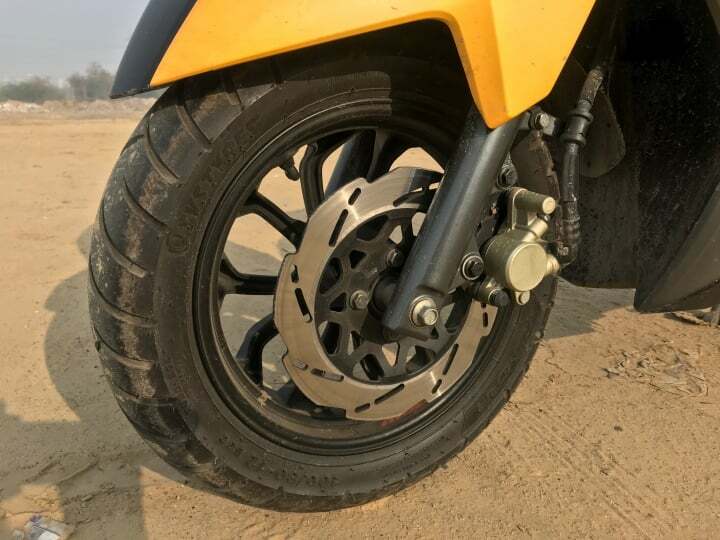 TVS Ntorq 125 gets a 220mm disc brake at the front and a 130mm DIA drum brake. Probably, the media vehicle which we had for the review had a tight rear brake, because it skidded over many times. The bite of both the brakes was good enough to reassure your confidence in braking from high speeds. After ticking all the right boxes, here is one place where it goes a bit down. Not much. Ntorq 125 gets a stiffer suspension setup, tuned keeping in mind that it is meant for performance. Over big potholes, heavy jerks were felt, heavy. But while cornering, it feel pretty right. The seat on this scooter is a bit smaller than other scooters. Two full grown adults with a noticeable belly were somehow adjusting. The footboard is also slightly smaller which does not allow you to rest your feet on the apron. Although, the seat was on the softer side and did not disappoint my bum at any time. Even for the pillion, the seat was stuffed enough. So summing up, it has some issues with comfort, but it would not make a huge difference altogether. A lot of other scooters have even stiffer suspension setups. 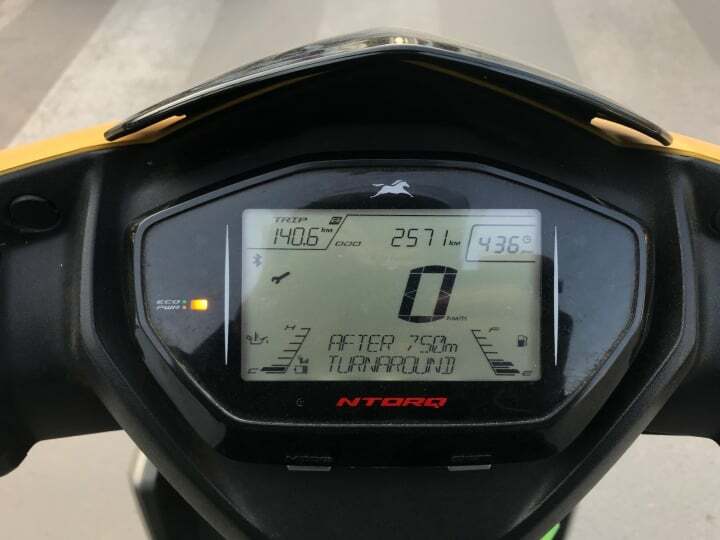 Being a scooter meant for performance, TVS Ntorq 125 delivers lesser mileage. On average, it delivered close to 41 kmpl, which is definitely lower than some of its rivals. But for an engine tuned for performanc, it is really not a place for me to complain. Ntorq gets a fuel tank capacity of 5 litres, delivering a rough riding range of 200-220 kms. A good thing for the college-goers, as a full tank just costs Rs 300 (Delhi NCR fuel rates). Here’s where the magic happens. 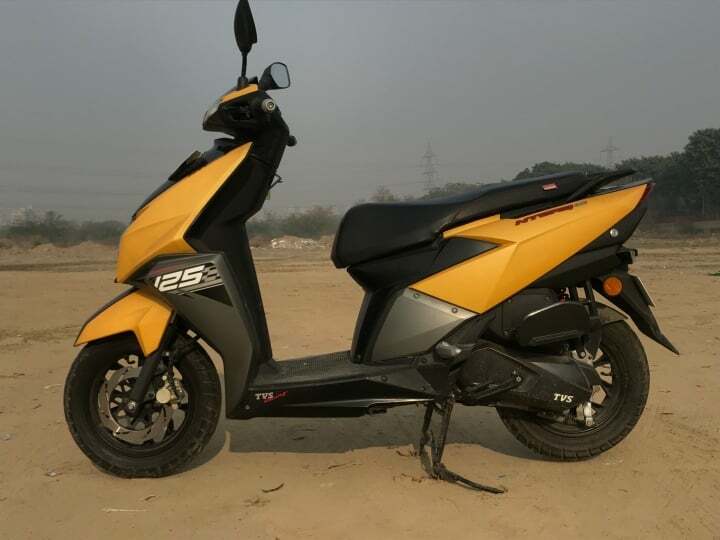 TVS Ntorq 125 is loaded with features to the brim. This is the most feature laden scooter in India, a typical TVS trait. Its premium highlight is the Bluetooth integrated speedometer. Whilst a lot of them might not use it, but it was of great use to me. The speedometer displays information such as lap timer, top speed, turn-by-turn GPS navigation, incoming call alert, incoming message alert, 2 Trip meter and a clock. For this, you need to download TVS Ntorq app on the Google Play store. Warning, the app is not available on iOS devices, which actually is a disadvantage. Most of the buyers consider the Bluetooth speedometer as one of its important feature, but for an iOS user, there is no use of it. 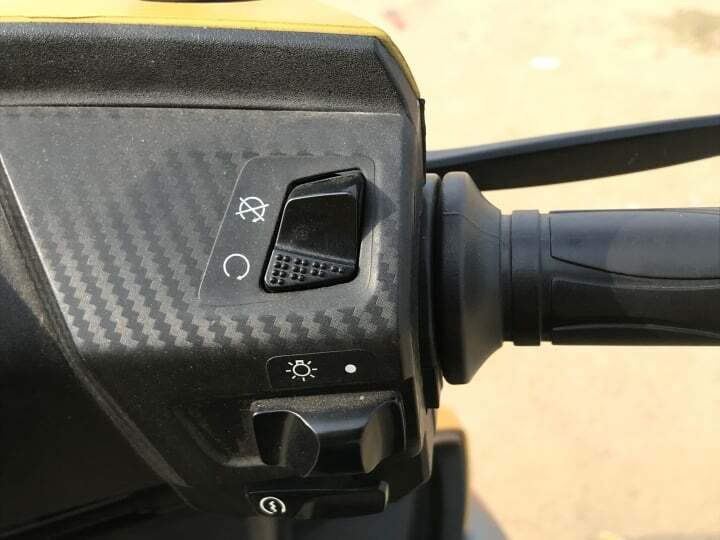 Other significant features include a segment-first engine kill switch, USB charging port, boot lamp, LED position lamps and Sporty graphics. Another disappointment was the small boot, which could barely fit a full helmet. Neither it can be kept properly on the footboard. TVS Ntorq 125 is the most premium offering from the Indian brand, and possibly the most premium in this segment too. It has easily passed most of its test, except comfort. But for a performance-oriented scooter, the setup is appropriate. 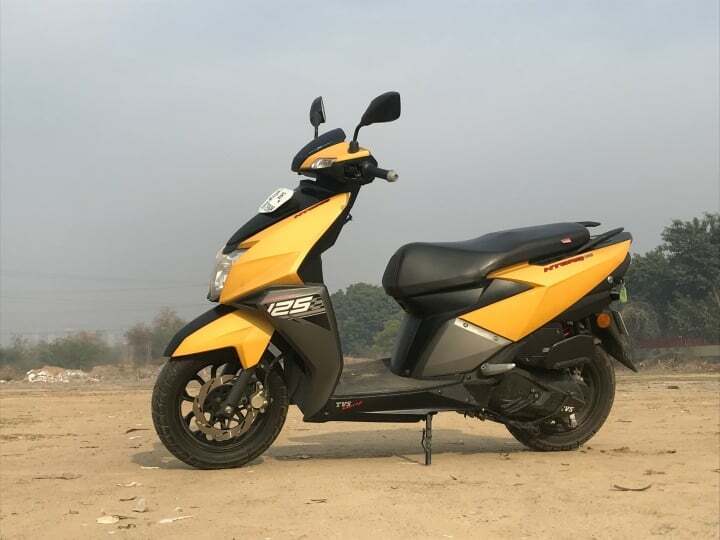 At a price of Rs 60,000, it is one of the cheapest in its segment, undercutting Honda Grazia and Suzuki Burgman Street. That combined with premium features, sporty appeal and the sporty engine makes it a total ‘worthy’ scooter. We wanted to check if its a complete racing scooter. Basically, you can call it an almost racing scooter or a 90% racing scooter. A peppy engine would have given it a 100% score.